No Shoes Nation Scavenger Hunt - 94.3 KAT Country! 94.3 KAT Country is giving away tickets to see Chesney at Mizzou Arena on May 2. Learn more about Kenny’s Songs For The Saints Tour stop at Mizzou Arena, HERE. Starting on Monday, February 11th, 94.3 KAT Country has your chance to win tickets to the show! 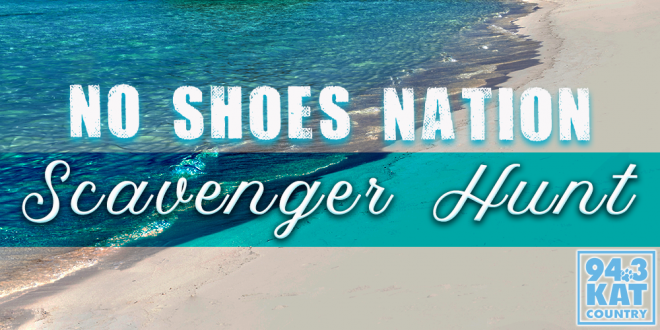 Your chance to win is with the No Shoes Nation Scavenger Hunt. Every day, 94.3 KAT Country will hide the No Shoes Nation flag somewhere on the 94.3 KAT Country website. We’ll give out a clue to where we hid the flag on-air each day at 7:20 am. Once you find the No Shoes Nation flag, “click” on it and you’ll be redirected to a registration page with your chance to win tickets. You can earn one new entry each day! Good Luck, and thanks for listening to 94.3 KAT Country. Be a great way to start the summer! !